Interact with Guam’s beautiful Marine Life! At ABC, All of the packages include FREE use of our Exclusive Snorkeling Course. The Exclusive Snorkeling Course is located in East Hagatna Bay. This course is accessible from ABC’s Beach Side Facility. Additionally, for our guests that purchase any Dolphin Watching Tour package or combo, Snorkeling is offered on the Dolphin Watching Tour depending upon time and weather conditions. Guam has about 400 kinds of coral which is twice the number that Hawaii has! Guam is home to about 800 kinds of fish. ABC’s Exclusive Snorkeling Course has 3 different snorkeling points that explain what you are seeing. In Addition, we have ABC’s Exclusive Snorkeling Platform sitting in the waters of Beautiful East Hagatna Bay. If time and weather conditions permit, the Dolphin Watching tour offers a Snorkeling experience. You will travel to the open ocean, and look for a majestic pod of dolphins. Once you finish observing the dolphins, and the captain deems it safe to swim in the water, we will offer you the chance to swim in the open ocean. 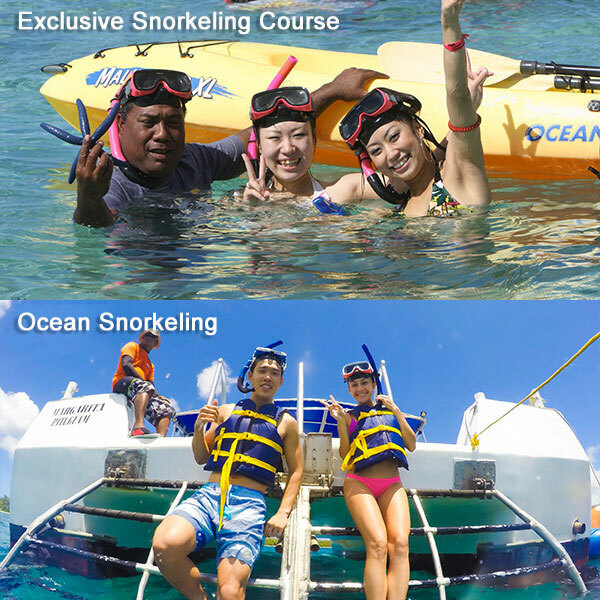 At this time, the Ocean Snorkeling option will allow you to put on a life jacket, a mask and snorkel and you will be able to swim in Guam’s pristine waters. We take pride in the outstanding clarity and diversity of species that Guam has to offer. In some rare cases, we may not have any time to snorkel because of the time restriction. Our friendly staff will direct you to ABC’s floating barge which will be the launching point for your Exclusive Snorkeling Course. Our friendly staff will take the photos of you underwater so you’ll always be able to have that amazing memory! You will be able to see and feed the fish while submerged under the beautiful clear water! The Ocean Snorkeling launches from the rear of the Dolphin Watching Boat. An amazing glimpse of sea life hits you as soon as your mask and snorkel look underwater. Our staff will brief you on the rules and regulations, and you will then begin. Masks, snorkels and life jackets are provided to adults and to children as well. This activity is included in super Beach Resort. It starts at the top of the hour every hour from 10:00am until 3:00pm. All of the equipment that you will need to Snorkel is provided FREE by ABC. Please note that all activities, including the Snorkeling Course, are subject to weather conditions. Those who are under the influence of drugs or alcohol, or those who have physical ailments cannot participate. Please refrain from bringing any alcohol. The activity included in a dolphin watching. You can enjoy snorkeling in the open ocean. In some rare cases, we may not have any time to snorkel because of the time restriction. About 20 minutes-30 minutes depending on the time and weather conditions. Swimsuit and a light change of clothes in a small bag. All of the Snorkel equipment and Life jackets will be provided by ABC. There is no age restriction, unless the Captain deems it necessary to keep someone out of the water. f you are planning on participating in the Ocean Snorkeling as part of the Dolphin Watching Tour, please wear you bathing suit with a light change of clothes over it. Please bring a towel with you as well. Since there is a bus ride to get to the Dolphin Watching Tour, it is best that you wear a light change of clothes that can be easily removed or put on.